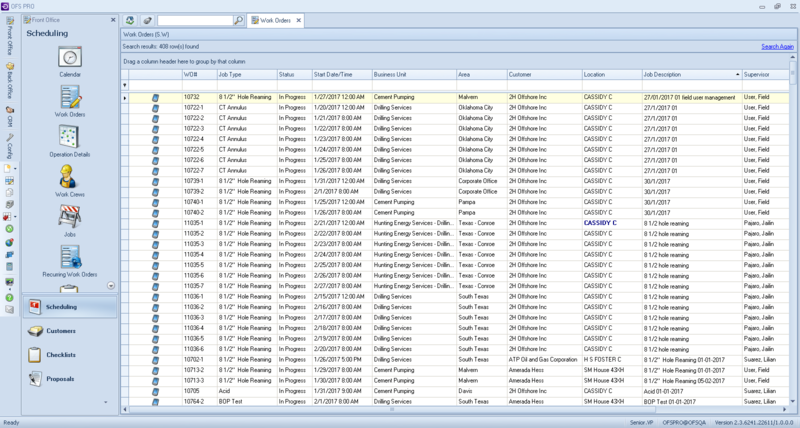 The Work Orders grid displays all Work Orders created within the system. Use the Search Criteria above the grid to filter your search by Business Unit, Area, Customer, Status and whether the Work Order is created for external or internal use. To view all details of any given Work Order, simply double-click its entry in the grid. For more information on the creation of a new Work Order, see “Creating a Work Order“. The following steps only apply to external Work Orders – ones created for use with your company’s customers, that will be performed by personnel in the field. Internal Work Orders – created for use within your company, such as for asset inspection or maintenance – cannot begin as Proposals and don’t need to be taken over when In Progress. Any external-type Work Order can begin as a Proposal. Unlike Work Orders, Proposals can be associated with only three statuses. Proposals generally begin life as a Proposal Draft. Akin to a Work Order’s “Pending” status, this draft is the working copy of a Proposal, which is not intended to be submitted to the customer. Proposal Drafts can be saved with only minimal information, or without requiring the assignment of a Supervisor, Employees, or Assets. Once set to Proposal, the document is complete and ready to be printed and sent off for the approval of the customer. Once the customer has approved it, the Proposal can be converted to a Work Order in the “Pending” status. If the Proposal offer is rejected, lost or canceled, it should be set to the Proposal Lost status. This will effectively close the Proposal to any modifications. Much like Proposals, Work Orders start out as a draft – in this case, the status is called Pending. A pending Work Order is in progress, and isn’t ready to be sent out to the field. For longer timelines, perhaps for larger-than-usual commitments, you can convert a pending Work Order to Incomplete status, and vice versa. This means that the Work Order lacks some necessary information and is set aside for the moment. Once a pending Work Order has at least one employee, one asset, and a supervisor assigned, it can be set to the In Progress status. Only Work Orders which are in progress are visible and able to be completed within OFS Field. In Progress Work Orders can’t be modified or completed within the office normally. To modify an In Progress Work Order from the office, click the “Take Over” button at the bottom of the Work Order edit window. Pending and In Progress Work Orders still have the possibility of being Canceled. If a Work Order is no longer necessary, or is a duplicate of an existing Work Order, it should be canceled. All tasks and assignments connected to the Work Order are canceled automatically. After the approval workflow appropriate for the Work Order’s specifications is complete, or if there is no defined workflow, the Work Order is assigned the Ready status. Only Work Orders in the Ready status (or Canceled) will appear on the Create Invoices screen.The finished Work Order still needs to be reviewed and given approval in the office. (See “Approval Workflow“). After the approval workflow appropriate for the Work Order’s specifications is complete, or if there is no defined workflow, the Work Order is assigned the Ready status. Only Work Orders in the Ready status (or Canceled) will appear on the Create Invoices screen. Generating Invoices does not affect Work Orders status. The icons that are visible in the Alerts column, show the status of Work Orders and Jobs listed in the grid.